Last Friday saw a gathering of thousands of workers of PMLAN and close acquaintance of Nawaz Sarif while his 68 year age of old wife Kulsoom Nawaz was being buried in Lahore. They were shouting slogans of ‘Madar-e-Jamhuriat’ means people’s mother. That’s how they know her and want to remember her. Kulsoom was not merely Nawaz Sharif’s wife but also a strong woman with her own identity. I got an opportunity to meet her during my visit to Lahore in ‘The Delhi–Lahore Bus, officially known as Sada-e-Sarhad ,’ to attend a summit in Lahore. Kulsoom was visiting her maternal home and her first question to us (few journalists friend) was whether we have visited Zhabbowal village in Amritsar. She was delighted to hear a very vivid description of ancestral village. She was very nostalgic about Amritsar. She considered Amritsar as her maternal grand parents’ home. She revealed that she was the grand daughter of world wrestling champion Gama. Who was born in Jhabewal village. In those days Gama’s entire expenses were being looked after by Maharaja of Jodhpur. Kulsoom had two sisters and a brother she completed her FA examination Islamia college and then completed her graduation from Foreman Christian College and then completed her MA Urdu in 1970 from Punjab university and her PhD degree on Faiz Ahmed Faiz’s poetry is a fact which is not known to many. She was very active in politics right from beginning. She was elected for the national assembly twice- 1990 and 1997. 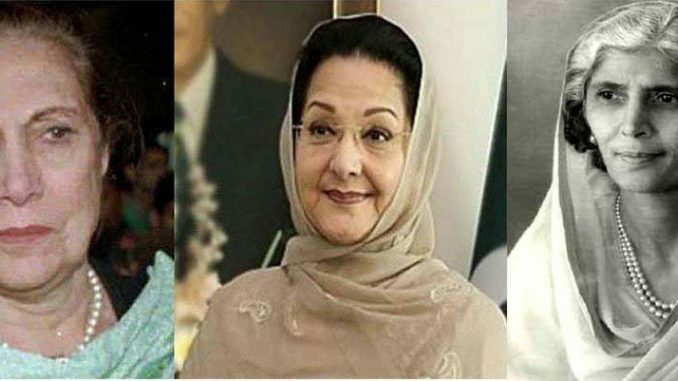 In the year 1999 when Pervez Musharaf over through the government, Kulsoom was also arrested at that time, “Kulsoom Begum is even more dangerous than Nawaz Sharif”, said Musharaf. In 2000 she was declared the president of Pakistan Muslim League and in spite of dictatorial regime Kulsoom dared to move out on the roads. She even started a march from Lahore to Peshawar but she was arrested on the way. People believed that she was the woman of supreme confidence and resilience. Many a journalist compared her to Indira Gandhi because of her mannerisms. Three women have left an indelible mark on Pakistan politics: the first being Bibi Fatima Jinnah, the sister of Qaid-e-Azam. She remained a lifelong care taker and companion of her brother. She even dared to take on the dictator General Ayub Khan who she challenges during the 1965 presidential election in Pakistan. When Aube Khan claimed that he was trying to develop a democracy she lambasted him, ‘What short of democracy, a one man’s democracy or fifty people’s democracy’? When Ayub Khan declared that anarchy will ensue after his defeat, she gave him a befitting answer that nobody can bring order through pressure and force and coercion. The spirit of women politician of Pakistan and their courage even the worst oppressors. Miss Fatima Jinnah, young sister of Quaid-i-Azam Muhammad Ali Jinnah, was born in 1893. Due to her brother’s keen interest, and despite strident family opposition, Miss Fatima received excellent early education. In 1919 she got admitted to the highly competitive university of Calcutta where she attended the Dr. Ahmad Dental College. In 1918, she got married to Rutanbai. Upon Rutanbai’s death in February 1929, Miss Jinnah wound up her clinic, moved into Jinna’s bungalow, and took charge of his house; thus beginning the life-long companionship that lasted till Jinnah’s death on September 1948. “There is a magic power in your own hands. Take your vital decision-they may be grave and momentous and far-reaching in their consequences. Think a hundred times before you take any decision, but once a decision is taken, stand by it as one man,” Fatima says always. Another woman crossed the threshold of her whom went her husband Zulfiquer Alli Bhuto was thrown behind the bars by General Zia Ul Haq when he declared martial law in Pakistan. Under these circumstances Begum Nushrat Bhutto took to the roads to campaign for Pakistan’s people’s party. A stone was hurled at her badly injuring her which was captured by many cameras in the Gaddafi stadium. Her daughter Benzir Bhutto also fought against the same oppressor for the sake of democracy. Nusrat Ispahani (Bhutto), she popularly known as “Mother of Democracy” was an Iranian-Kurdish public figure who served as Spouse of the Prime Minister of Pakistan between 1971 until the 1977 coup, and as a senior member of the federal cabinet between 1988 and 1990. Born in Isfahan to a family of Kurdish descent, the family had settled in Bombay before moving to Karachi after the Partition of India. Ispahani joined a paramilitary women’s force in 1950, but left a year later when she married Zulfikar Ali Bhutto. She moved to Oxfordshire with her husband who then was pursuing his legal education. She returned to Pakistan alongside Bhutto who went on to serve as the Foreign Minister. After her husband founded Pakistan Peoples Party, Ispahani worked to lead party’s women’s wing. After Bhutto was elected as the Prime Minister in 1971, Ispahani became the First Lady of Pakistan and remained so until her husband’s removal in 1977. She immediately succeeded her husband as the leader of the Peoples Party, and, while under house arrest, fought an unsuccessful legal battle to prevent her husband’s execution. After Bhutto’s execution, Ispahani, along with her children, went into exile to London, from where in 1981 she co-founded the Movement for the Restoration of Democracy, a nonviolent opposition to Zia’s regime. It is ironic when another dictator Pervez Musharaf asked her not to return Pakistan, she was murdered in Rawalpindi a few spaces away from Musharaf’s administrative office. At present also there are many women activists keen on, amicable relations with India tough on that list being Faiz’s daughters, Manto’s daughters, Dr. Saeeda Deep and many others. On this coming 25th September these women are planning to hold a candle march the place where Bhagat Singh Rajguru and Sukhdev was hanged. This candle march is held twice every year. But the sad truth is in spite of so much of political awareness and activity the rule exploitation and oppression does not seem to be coming to an end. Let’s see if Imran Khan’s arrival on the Pakistani political seen changes the fortunes of this beleaguered nation.